Canada, 1980, 94 minutes, Colour. Robert Mitchum, Lee Majors, Valerie Perrine, Alexandra Stewart, Saul Rubinek. Agency is based on a novel by Paul Gottlieb. While the material is interesting, it is not a particularly good film. What is interesting is the theme of advertising, the role of agencies, the people who staff agencies and their work and inspiration, the effect on the public. However, it is also about subliminal advertising in television, especially for political purposes and power. Robert Mitchum plays a mysterious millionaire who buys an agency, changes the employees, knows nothing about advertising and is unmasked as making subliminal advertising for elections. 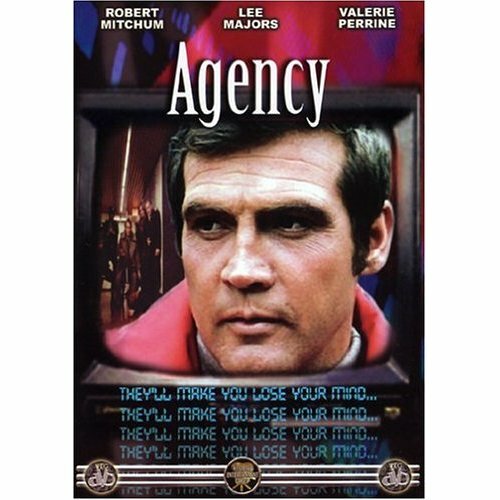 Lee Majors works at the agency, a strong and stolid hero, who begins to investigate the mystery about the owner and his life is threatened. Valerie Perrine portrays a doctor, his girlfriend. Alexandra Stewart also works at the office. Saul Rubinek is a wild card, bent on exposing what is happening at the agency. This film is an easy entertainment, not particularly demanding, despite the interesting premises. 1.The title? The photographing of the buildings, the interiors? The agency? The atmosphere about the agency? 2.The Canadian background, standing in for American cities? The city itself? The countryside? Authentic atmosphere? Musical score? 3.The cast, its strength? The quality or not of the writing? The conventional directing of potentially interesting material? 4.Philip Morgan, his jogging, meeting with Brenda, their relationship, his past marriage, his attitude in the agency, his skills, arrogant? His dislike of Ted Quinn? Listening to Sam Goldstein? Friendship with Mimi? His work, the various jobs, the secrecy, people being sacked? The discussions with Sam? With Brenda? His being used by Ted Quinn? Given missions? Sam's death, his taking the tapes, listening to the tapes? The further investigations, the danger? His being accosted by the thugs? His getting away from them and the bikies? His meeting up with Brenda? Asking Mimi's help? Watching the subliminal advertising? The encounter with Ted Quinn, the confrontation, the explanations, Quinn being shot? 5.Brenda, as a doctor, her relationship with Philip, helping him, the tapes, hiding them, the attack on her, giving over the tapes? Helping Philip in the final confrontation? 6.Sam, erratic, skilful, suspicious, paranoid? His death, the tapes and the flashback showing him speaking the tapes? The fact that he was murdered? 7.The various members of the staff, Mimi and her closeness to Ted Quinn? Using Philip? The discussions, the suspicions? 8.Ted Quinn, owning the agency, watching the material? Sacking people, his manner of administering the job? The confrontations with Philip, the gun? The thugs? The final explanations, the use of power? The fascist ideas, the despising of ordinary people? His death? 9.The theme of subliminal advertising, its possibilities? The comment on the public? On agencies and the need for regulation, supervision? The implications for politicians and power?